Back to work after three days off. 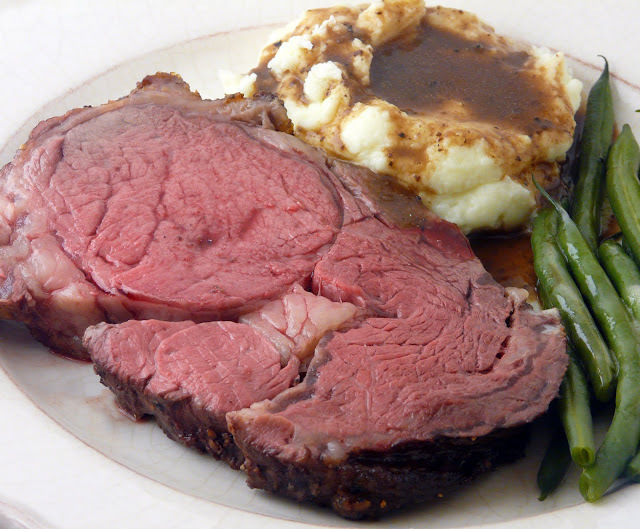 I took a small boneless rib roast out of the freezer for dinner. After it thawed Moe salted it. Seasoned with fresh garlic and lots of coarse ground black pepper, it was started on a hot grill to sear and then finished off in a 500°F oven. It didn't take long to reach "perfect". It came out of the oven at 118°F and left to rest while the potatoes and the green beans finished cooking. 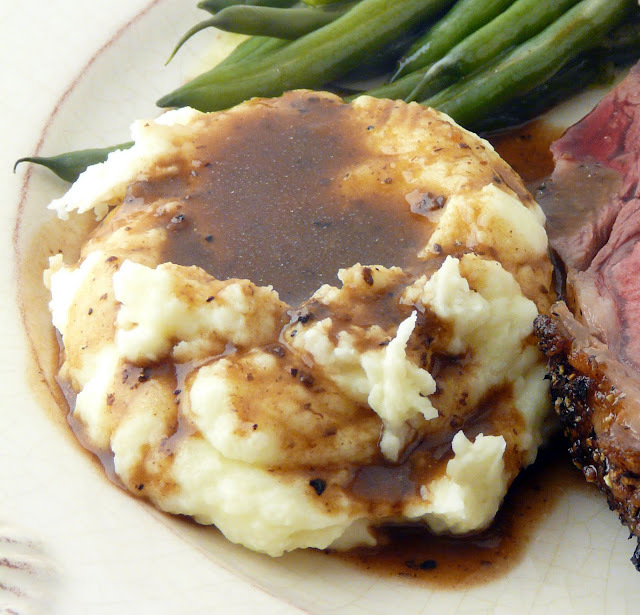 A little sprinkle of flour, a splash of red wine and another splash of beef broth to the scan drippings and there was just enough gravy for the mashed potatoes. which will not influence the cooking time." 1 recipe for Yorkshire pudding. 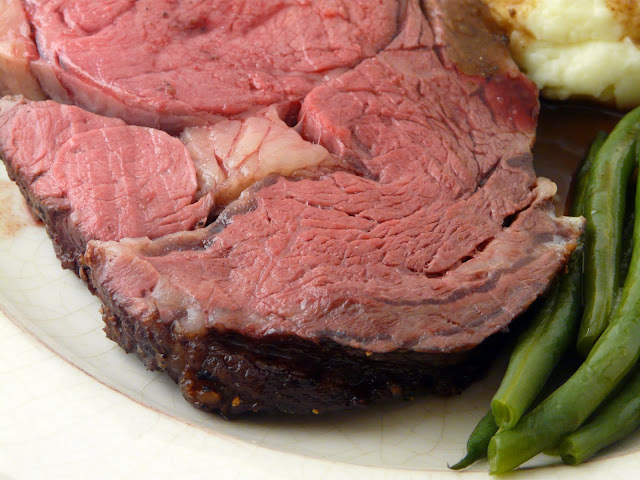 Roast should be at room temperature, not taken directly from the fridge. Place oven rack on the second level from the bottom. Heat oven to 500°F. Place small roast in a 14 X 12 X2 inch roasting pan. bone side down. The large roast will need an 18 X 13 X 2 inch roasting pan. Snuggle most of the garlic, is using, under the fat and spread remainder under the meat. etc..Increase heat to 450°F and roast for another 15 minutes regardless of size. Meat temperature should read 135 on an instant - read thermometer. If you like it more rare, reduce the additional 3 minutes per pound to 2 minutes or for less rare, increase the 3 minutes to 5 minutes. reduce by half. Pour liquid into a small saucepan and reserve. For Whole New York Strip Loin, the directions are a little bit different. According to Barbara Kafka's instructions, it doesn't matter what size the New York strip roast is the directions are the same. 2 tablespoons basic veal glaze optional. Place oven rack on second level from the top of the oven, or second from the bottom if the fat cover is thick. Heat oven to 500°F. Place strip of beef in an 18 x 12 x 2 inch roasting pan. If using, slip whole cloves of garlic between underside of meat and string. Tuck in the thyme. Slip some more garlic under the string along the top of the meat. Sprinkle the meat on all sides liberally with salt and peper. Put into oven one hour before it will be served. Roast for 40 to 45 minutes. Remove and transfer meat to a platter. Cut off strings. Remove the garlic cloves that are too blackened to use. Pour fat from pan. Put the roasting pan on top of the stove. Add stock or wine and the veal glaze, if using and bring to a boil, scraping the bottom vigorously with a wooden spoon. Add flavorings, if using, and any juices that have collected in the platter on which the beef is resting. Let reduce by half. Taste for salt and pepper, pour into a sauce boat and serve. According to Barbara........"I buy the meat by the inch. It cooks exactly the same way no matter the length as long as it s more than 4 inches long. When ordering, I usually allow about an inch and a quarter per person and an extra half inch for the two end slices. By this rule, six people will require an eight inch piece of fillet. The muscles in a fillet all run lengthwise so that when it is sliced a crossed the serving it is also tenderized. The fillet is also called the tenderloin, and it is tender. It is a long round muscle that hides behind the bones on which the shell steak and the rib roast reside. T-bone steaks have some of the shell and, on the other side of the bone, a circle of the fillet, or tenderloin. A filet mignon is a slice cut acrossed the whole fillet to make an individual steak. Place fillet in an 18 x 12 x 2 inch roasting pan. Rub fillet with butter and oil. Sprinkle evenly with salt and pepper. roast for 10 minutes. turn. roast 10 minutes more. Transfer fillet to a serving platter. Pour or spoon off excess fat. Put pan on top of the burner. Add the wine or sauce and bring contents to a boil while scraping the bottom of the pan with a wooden spoon. Let reduce by half. Season with salt and pepper. OH Ann - that looks fantastic! 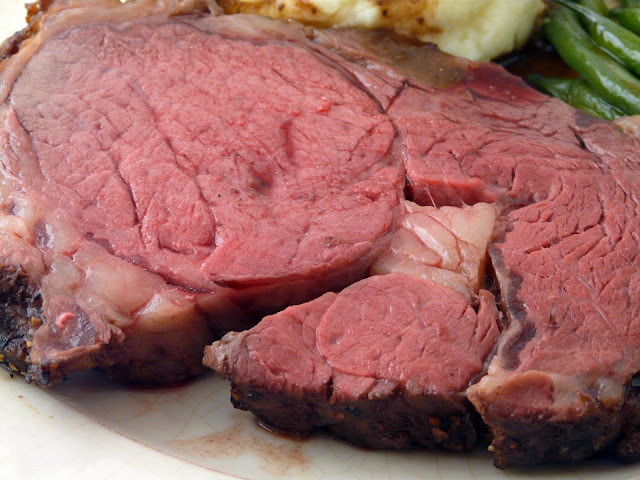 It's been so long since I've had Prime Rib and yours is cooked perfectly. Great photos! Yes, I believe "perfect," pretty much sums it up! Ann, I had to stop by today (in case my workload catches up with me next week), and wish you a Very Merry Christmas to you and Moe! That is a perfect piece of meat Ann....looks delicious! Can you believe that my Ole Sweetie-Pi only eats his beef medium well, NO pink whatsoever. Criminal. What a great looking piece of beef!